The only thing investors in Urban Outfitters anticipate more than the company’s quarterly earnings call discussion is the discussion this community has after the call!! This I had re-confirmed recently during lunch with some friends of mine who work in the financial industry as analysts and such. So community, if you’ve ever wondered if Anthropologie’s leadership is reading, and if the analysts come here looking for customer feedback the answer is a huge YES. Whether the leadership is doing anything with our feedback or not…well, that’s another question altogether. I could end the post right here, but that would be no fun, right? So let’s dive into Anthropologie parent company’s Urban Outfitters latest quarterly results, for fiscal Q3 2018. “For the quarter, net sales for Urban Outfitters increased to $892.8 million. Net sales by brands gained 1.6% to $353.9 million at Urban Outfitters, 3.3% to $362.4 million at Anthropologie Group and 7.8% to $180.6 million at Free People. For Food and Beverage net sales came in at $6.2 million compared with $5.8 million in the prior-year quarter. “By brand, our Retail segment adjusted comp rate was positive at all three brands with increases of 5% at Free People, 2% at Anthropologie, and 1% at Urban Outfitters. These comps have been adjusted for the two hurricanes experienced in the quarter. The adjustment represents approximately two-thirds of a point at each of our brands. Additionally, we delivered our first Anthropologie Home wholesale order in the UK. We believe Anthropologie wholesale of the Home category has strong opportunities to grow with key partners in Europe, as well as in North America and we are excited to have completed their launch into this new channel of distribution for the brand. Gross profit decreased 1% to $298 million versus the prior comparable quarter. Gross profit rate declined by 142 basis points to 33.4%. The decline in gross profit rate was primarily driven by the leverage in delivery and logistics expense due to increased penetration of the direct-to-consumer channel, higher International penetration, and increased furniture penetration. Firstly, congratulations Anthropologie! I must admit that this positive news initially came as quite the shock to me given that the clothing assortment isn’t really appealing to me yet. But the more I thought about things, I realized a few details I might have overlooked. During its last few promotions, the NYC Anthropologies have been fairly swamped, even during the workday. That’s a positive change. It’s important to note that Urban’s results were adjusted for the hurricane, as most North American companies have done. UO’s stock is up 45% this year, though it’s still well below previous highs the stock enjoyed two to three years ago. Still, with the sheer volume of stuff hitting sale and just sitting there, I had a seriously raised eyebrow reading this next bit. Not just a raised eyebrow — a seriously raised eyebrow. “…good evening everyone. I am pleased to provide you with an update on our progress within the Anthropologie Group. As we mentioned on our last call in August, we were seeing early signs of improvement in North America in our fall product reads. I am happy to report that during the quarter we did indeed see a change in our business trajectory. The Anthro Group retail segment comp sales improved in the third quarter to a plus 2% comp, a 600 basis point improvement from Q2’s minus 4% comp. The trend improvement in North America was broadly based across expanded categories and apparel divisions in both selling channels, and importantly, comp sales quality also improved with regular price comps outpacing markdowns. The direct-to-consumer channel had another strong quarter of double-digit growth. Momentum in this channel was driven by improved digital marketing effectiveness, a broader assortment that we continue to expand and creative assets that increasingly market the lifestyle experience. The Anthro Loyalty member path to free shipping significantly increased new signups and overall Digital customer counts. Also lifting average transaction value with more units in Her basket. We continue to invest in our digital shopping brand experience and the data analytics that power best-in-class digital merchants. As we have spoken of previously, the majority of our revenue decline in recent periods was due to the execution of apparel. In a short period of time, Hillary and the apparel team focused the offer on the separates trend that echoes much of what is happening across the fashion industry. They also concentrated on delivering more color, pattern, and special details with a touch of hand for which Anthro is known. In all seriousness, these comments concern me a bit, because apparently the powers that be think they’re righting the apparel ship…and I don’t agree. I do agree that there has been small measures of improvement in the clothing but I’m certainly not drooling over every new release with a 100 item wishlist like I used to on a weekly basis. I’m glad to hear that the apparel team is squarely focused on delivering special details and a “touch of hand for which Anthro is known,” because yes that is what we want! But there are still major issues. The assortment is still way too big and not cohesive, there are too many specialty clothes and not enough workwear, there’s too much short and boxy and unflattering stuff still. But…even as I’m writing this, I have to say that in my recent store visits and over the last quarter, I have noticed people in front of me in line making large clothing purchases. So even if I’m not getting it, it’s quite possible that this is more me missing old Anthropologie than anything about the current assortment. It’s kind of like when I visit my favorite J. Crew blogs and most everyone is whining and moaning, while I’m sitting in my chair thinking that I am not getting their whining at all because I like so much J. Crew right now! 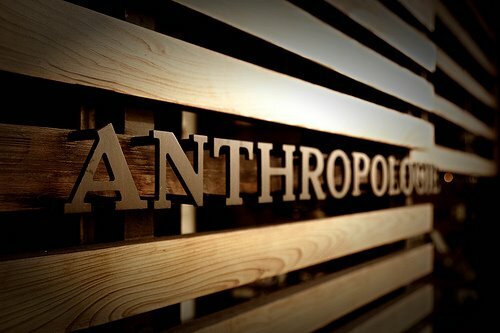 Another possibility is that Anthropologie’s growth and positive sales trends are being led by their other categories. I almost don’t want to talk about this because I and many of you have said so often, we don’t really want Anthropologie straying too far from clothing into other categories like beauty. And yet, it’s hard to fight this ever pressing tide. I have to admit…I’ve really delighted in the new small size beauty and self-care items sprinkled along the line to the cash registers. This idea, piloted by drug stores way back in the 1950s, proliferated into grocery stores (candy! magazines! chapstick!) and then beauty stores, and now Anthropologie. I think it’s lovely. I’ve found so many little treats to delight in and as weird as it may sound it makes me think of the old Anthro, where a lazy meandering path leads me to some wonderful discovery. 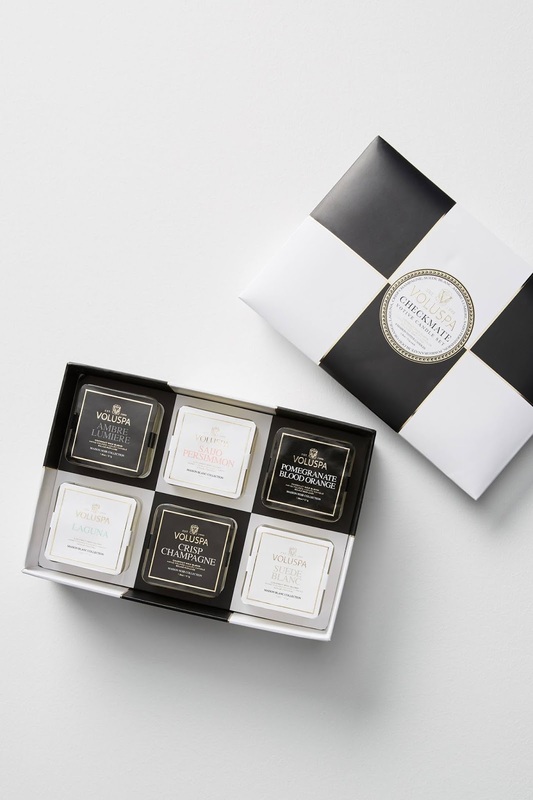 In addition to finding the Voluspa Checkmate Votive Candle Set ($48, above), which made a fantastic hostess gift she’s thanked me for in five straight emails, I’ve also find great gift ideas and stocking stuffers like the Demeter Zodiac Perfume ($40), the Pom-Nosed Reindeer Bar Soap ($10), the Mer-Sea & Co. Mini Spa Set ($32) which smells so dang good, the Rendez-Vous Soothing Gift Set ($88), the Relax Gift Set ($69), the Albeit Mini Lipstick Trio ($28) and the Faux Fur Cowl ($58). These tokens have been wonderful for me — especially for Hanukkah, where I exchange eight gifts with one group of friends each year. I need small all the way up to big! Another area Anthropologie is killing it in right now is Home, especially entertaining essentials. Ok, and entertaining non-essentials that I want anyway. Their cheese boards and mugs in particular are killing it right now — this cheese board is on my must-have Christmas list, and my picky boyfriend absolutely loves these mugs in last year’s gold letter version that I bought as housewarming gifts when we moved into our current apartment. So I wonder, are other categories besides apparel propping Anthropologie up? And if so, will this only accelerate their trend of moving away from clothing store and into de facto department store? If so, wah. (That’s me pouting.) I don’t want them to become a department store. But maybe the train has left the station. “…Quite simply, fashion is back and it’s selling. Demand for apparel driven partially by the shift in silhouette that I’ve alluded to in previous commentaries, finally gained traction in North America during the quarter. Regular price sales of women’s apparel was positive at each brand led by Urban Outfitters with the European group’s sales being especially powerful. As Trish [Donnelly, Global Chief Executive Officer, Urban Outfitters Group] noted in her commentary, our merchants were able to read and react to the demand because of improvements we’ve made in our speed-to-customer capabilities. I believe these competencies, which we are still refining and implementing, will become increasingly important as the customer demands more newness and fashion trends have quicker adoption rates and shorter life cycles because of social media use. Based on the positive response to our current fashion offerings combined with our improved ability to execute looks more quickly, I’m optimistic that our merchants will be able to deliver compelling fashion through the holiday season and well into next year. We are excited by the top-line potential created by the confluence of these two trends. Social media is an area I’ve been rethinking for my blog. I’ve loved Instagram as a place to discover beautiful photography, and it’s since merged into a powerful platform for style bloggers. No doubt about it. I’ve enjoyed great growth there and gotten lots of new blog readers out of it which I like, but after trying out the buying cycle last Spring I felt…kinda empty actually. I enjoy showing off outfits as much as the next shopping lover, but I’ve grown out of the cycle of needing to buy something new every week. I simply have little desire to keep up with the editorial schedule Instagram’s algorithm demands. I took the Summer off from Instagram and barely missed it. When I came back to it in the Fall, instead of feeling inspired by my fellow blogettes and their cute outfits and candid photos and such, I just felt tired. I’m sure I’ll go back to Instagram — every so often I still post a photo, but in talking to brands via both blogging and my day job channels, it seems like Instagram has peaked and brands are now looking for new ways to connect with customers, and I’m looking for something that feels a little less business-y and a little more like personal connections. But I also enjoy the business perks of Instagram so I suppose I’m talking out of both sides of my mouth here. At some point blogging morphed from petition against the homogeneous fashion media to becoming just as homogeneous…all of a sudden we’re all looking for sponsors and such, and while part of me of course wants to be the cream of the crop and enjoy all the trappings of success, I do not possess the killer mentality that most of today’s top bloggers do. I can’t keep up with all the comment pods and posting 3x a day with different posts on each social channel and loop giveaways and I’m not interested in trying any of the paid formats to growth. Anyway, I bring this all up here because per Mr. Hayne’s comments, one of the pitfalls of the social media cycle is that many bloggers (myself included at times) feel pressure to post new outfits each day, and this does indeed feed into the cycle of disposable clothing. I have so many items in my closet I love right now and I’m not really looking to add much to it. Do I need to replenish and replace once a season or so? Sure and I probably still buy more than the average person. But I don’t really feel the desire at the moment to cycle my closet completely or even 50%. So when I see many of my cohorts who are happily where I used to be, buying a lot and loving it, I wonder how we can possibly keep this going much longer. Does everyone really need new clothes every quarter? I doubt it. More often than that? Can I want clothing more often? Of course, and there’s no judgement here. I just wonder how much longer this cycle of consumption will last before it breaks down. “Before I close, I do want to say a few words about the holiday season. We all know this time of year has become highly promotional and somewhat unpredictable. We have no reason to believe this year will be different from a macro perspective. Many times on the call, the leadership cautioned that the holiday season is unpredictable. And they also mentioned that their strategy is pressing towards reducing markdowns and promotions. Yet I can’t imagine avoiding markdowns and promotions when nearly every other retailer will do them, increasingly, heading up to Christmas and right afterwards. What do you think? What is your reaction to Anthro’s positive quarter, and the comments by the leadership team here? Are you shopping at Anthropologie for holiday gifts? What do you think of their clothing, home, beauty and entertaining offerings? Absolutely fascinating on many levels. I really liked your analysis, as always. Nodding my head over here. I found their comment about expanding their wholesale furniture business exciting…I hope this means they have plans to get furniture into Canada. Their comment about delivering more "creative assets that increasingly market the lifestyle experience" was also very interesting (delivering 'creative assets' = my line of work). I think they're referring to the catalogue and online features and I have noticed a return there back to the storytelling they used to do. It's still not as good as it was, but it's headed in a hopeful direction. The coloured backgrounds on the site are still awful though. The idea that they are cycling to match fast-fashion's pace is such a disappointment. It's not going to be sustainable. People see that they can get a beautiful embroidered peasant shirt at Zara for $29 and wonder why something similar at Anthro is 10X more expensive. And I'm totally with you on the Instagram fashion thing. Lately I've been unfollowing IG feeds that post multiple outfits per day, or totally new clothes each day, because it just feels over-consumptive and kind of ick. I love the ones where I see them doing new things with the same basic wardrobe, adding something new once in a while. Actual style vs just constant shopping. My favorite IG fashion feeds are from people who keep wearing their favorites, not even always mixing it up. It shows that they feel good in themselves and like their own clothes. I even bought trousers because of that. Agree on the wholesale furniture news being exciting! One of my only disappointments with the larger format Anthropologie & Co stores has been that they don't have nearly enough furniture in them. Some have multiple 'rooms' but I'd much more interested in seeing all the chairs, rugs, accent tables, etc. than I am seeing how they might go together. Leave that to the website, you know? Nothing worse than buying a beautiful chair or bed online and then finding it extremely uncomfortable. Even with free returns it is a huge bother as you have to take time off work to be there. I used to love shopping there for clothes but not anymore… definitely purchasing beauty and home things though! I really can't tell whether it's because I miss the old anthro clothing or whether I'm in a different life stage now? For example, during the fall/winter months, I used to buy a coat or jacket from Anthro annually and would get so many compliments (even to this day), but none of what they have now speak to me like they used to! I think this is a key point. I have been an Anthro shopper for 12+ years now and maybe I am growing out of it? But I don't think so. I think Anthro needs to STOP chasing fast fashion trends and be a lifestyle brand. So you can look at someone and think they are an Anthro woman living the Anthro lifestyle. Like how all the old catalogs used to sell this whole wonderful lifestyle. I see some gorgeous clothes in the store and online these days. Online they are so bizarrely photographed that it turns me off to even click on them. But they are also still so hit and miss and the misses are egregious (have you seen the droopy boobie denim shirt yet?). Home quality is amazing. I am buying so much home stuff there it's insane. So what y'all are saying is that there is not one, not two, but THREE droopy-boobie denim shirts. Anthropologie — Your Headquarters for Droopy-Boobie Denim Shirts! This thread is classic! Haha!! I'm so tired of them playing with proportions and thinking OMG what a great idea! It looks like a high school design class project or something. I really dislike the online photography with the weird poses that obscure the clothing. There is zero styling these days. Like the tops section is 3 models wearing the same jeans with a bunch of different tops, alternating a repertoire of weird poses to mix things up. And there is something else missing in the way they photograph. Lately I am actually finding a lot of things that are MUCH nicer in person than online. That's so true. Oftentimes I'll see something in the store and think how lovely then I go and look at it online and it's featured at an angle with some off-balance model trying to look like she's having fun windmilling her arms and legs. LOL don't give them any more ideas! Oh yes the coats! I totally agree PHG. They used to have the most beautiful Fall coats that even in years when I didn't have to have one, I had to have one, you know? Thank you for the post, as always, Roxy. I think the investors may be paying more attention to your analyses than Anthro, though. It has been obvious for years that some of the buyers are stellar, with high-quality clothes, accessories and shoes selling out almost right away at full price. Almost all items that are online-only outside places like NYC. The free-shipping certainly has boosted that aspect, just as you have been saying since the beginning. For most of the rest, it is tat to fill store space. I'll withhold my opinion of Hayne and McCreight. I wonder what stores are closing, and why on earth they would open 19 more? Expansion to new areas I'm guessing? That's the only reason I can think of to open new stores. Also, I left it out of this post but Free People is doing gangbusters. I wouldn't be surprised if most of those are FP stores. Thanks for breaking down the report, and for your insight, Roxy – these are some of my favorite posts on this blog! I agree with you that as far as apparel goes, there are still way too many misfires, and just too much in general. My wishlist is much smaller than it used to be. BUT – my shopping there did pick up there slightly over the fall, and I did a sizeable BF order; thinking I'd return a good chunk of it. But guess what – I'm really struggling over what to return, because I like so much of it. I also noticed that the Cecilia Prado maxi sold out entirely over BF weekend, and for good reason – it's amazing. I have never bought anything that expensive before with merely a promo – I always wait for sale. But I was willing to invest in that dress, and a few other things I'd normally wait for sale on (some of which also are now sold out, so I'm glad I got them). There is still a lot of junk to wade through, but when they get it right they really nail it. So, I'm seeing improvement. I doubt they are ever going to be my go-to store again, but I am buying more these past couple of months than I have over the past year. I will say this, though (since I know Anthro is reading). Eliminating the promos/sales is going to stop that increase in spending dead in its' tracks. I don't think the clothes are worth what they charge at full price, and I'm willing to let things go if they sell out right away at full price. I don't get caught up in that bull. I know I can always find something I like somewhere else. As for the fast fashion – yes, I like clothes – a LOT, and I do pretty sizeable wardrobe purges twice a year, selling what is no longer (or never did) work for me to fund getting some new things. I don't shop in fast fashion stores – I prefer consignment shops, where I can still find less trendy, but great quality and unique items. I would love to see a blog where someone takes a capsule wardrobe and makes a ton of outfits out of it, (I've been toying with the idea of starting one myself). Instagram bores me – I'd rather read a blog and get to know someone. And I don't like the "gotta have it all" mentality. I really don't want to see Anthro going the fast fashion overconsumption route. They ought to have a little more class than that. You can dress well and have fun with clothes without destroying the planet, your bank account and your soul. Totally agree that ending promos would be the kiss of death for them. Most everything is so overpriced and only starts to move during promos. But I think more things are now selling with a percent off promo vs. markdowns. Several full price items I had my eye on had been just sitting there, but sold like crazy with the BF promo. For those few things I really loved, it was worth going with the 30% off since it was clear that those items were going to sell out before making it to markdowns. I think the strategy of higher prices (priced to promo) with frequent percent off promos is working for them, and as much as they would like to eliminate the discounts (like the good old days), it would not be a wise move. Yes I agree, when the quality and design is there Anthro is doing very well, it's no wonder more items are selling out! Though even the Cecelia Prado dress needed a promo to do it. So good news, no good news kinda deal? Yeah – it goes back to the fact that the clothes are not worth what they are charging full price. If they sell out at a promo, that's pretty much what people think it's worth. Try http://www.puttingmetogether.com. She takes a capsule wardrobe and makes a ton of outfits. She also uses her items over and over within the same season and year after year. Thanks for the post. Your analysis is spot-on, as usual. I think, for me, what disappoints me even more than the proliferation of straight-up ugly, unwearable stuff, is the influx of Michael Stars, Splendid, Rails, etc. bland and generic stuff you can find anywhere. I like those brands just fine, but I don't shop at Anthro for basics you can buy at every department store. I shop at Anthro to find something special. They really need to reinvigorate their in-house brands. Maeve still has dependably cute stuff, but, for example, who decided to morph Floreat into an underwear line instead of all those beautiful embroidered tops and dresses? Discontinuing sales/promos is only going to work if they VASTLY improve their offerings. If they start selling unique, high quality clothing with special details again, they won't need to offer regular discounts (even if everybody else is doing it) because people will pay regular price if 1) the regular price is fair and 2) you can't find the same or similar item for less money elsewhere. The housewares and giftables are still a bright spot at Anthro, and I still consider Anthro a "go-to" store for gifts even though I no longer feel that way about the clothing. I'm sure the home and beauty categories are helping prop up the company sales; I can't even count how many times I've walked into the store hoping to find a pretty dress or sweater, and ended up walking out with a candle, lipstick, or mug I didn't really need, just so it wouldn't feel like a wasted trip! oh my gosh–ALL the Michael Stars that is happening at Anthro—I just don't get it! I have been calling Anthro the Michael Stars Store. So unnecessary to have that much of it. I would rather Anthro focus on their own brands like before rather than offer stuff you can buy elsewhere and for cheaper. I have shopped at Anthro since 2008 and in the first few years, bought only clothing. Now, I buy almost no clothing, but am buying A LOT of home items that are amazing in quality and special details. Anyone who visits my home delights in the the fun pieces throughout (inlay mirror, tufted pillows, latte bowls, Liberty napkins, embroidered curtains, amazing candles, plushy area rugs, spa bath products, etc), as do I on a daily basis. I truly wish my wardrobe could echo the awesome feeling my home emanates. My home decor feels very "me" in a way that really resonates and that is entirely lacking in the clothing offerings. I have been in-store frequently shopping for the holiday season as well as hoping to find a few winter work appropriate outfits for upcoming meetings/conferences. I have struck out on clothing. I don't want to wear cropped boxy sweaters or peasant tops or enormous oversized sweaters or kimonos to work. Many of the higher quality items are on-line only and with sizing being so inconsistent, I get frustrated placing on-line orders for them only to have to do returns. I echo Roxy's comment about the assortment being unwieldy. So many pages to sort through and so little cohesion in the collection making it really tough to put together outfits. I will continue shopping at Anthro for unique, special items for my home. I will spend my clothing budget elsewhere. I think they are patting themselves on the back a little too hard. Their clothing isn't all that great. There are so many ugly, unwearable clothes still that the nice stuff is few and far between. My sister and I each used to have long Anthro Christmas wish lists and, this year, we could hardly find things to put on our respective lists. If they would please stop infusing the Free People and super trendy fashion vibe into their clothes and go back to what made them great in the first place, then maybe I could get on board again. You still have major work to do Anthro! Don't sit there on your corporate high horse and not listen to your customer base! As much as I am in the "bring back Old Anthro" camp, I can appreciate the need for the company to move forward with the times. They do have to "modernize" to some extent. Remember how big Laura Ashley was, both in clothing and home? And how after a few years, they just faded away? I understand that Anthro needs to evolve, but they need to find a way to still honor their roots. Funny that you mention Laura Ashley … I was just at a very mixed-age party and some people were talking about what happened to that brand and they all agreed it wasn't the style changing but that the quality kept going down and down after the founder died. Agreed. I think that when people say they miss "old Anthro" what they're really saying/missing is all the attention to detail, more structure and classy designs in general. I can still go to a second hand shop or take a look in my own closet and pick out an oldie but goodie and find that it's still in style to this day because it's so timeless and makes me look good and feels unique. A lot of the trendy clothes they keep releasing lately, I just don't see a long shelf life so basically I see it as money wasted. Back in the day, I was always pretty confident that what I purchased at Anthro would stand the test of time. I agree with you, Jess. It's not like we are saying we would like Anthro to stay back in time with fashion. We have come around to various trends like skinny jeans, then high waists, etc. What we are reacting to is that women don't want to have some of these hideous trends shoved down their throats, and we are going to vote with our wallets! I hate some of this '80s inspired stuff that wasn't flattering then, nor is it now. If I see Anthro continuing with short and boxy tops or everything so sheer, I will stop buying their tops. I like how they offer camisoles that you would need to wear a camisole under. Ridiculous! If they can't offer a single pair of normal classic trousers, I will stop buying their pants. If they continue with huge dolman sleeves I will stop buying their sweaters. I wear my vintage Anthro pieces, and people stop to ask where I got them. It is because they are classics. That is what we are asking for! I have suggested before that Anthro at least offer a collection, called "Classic Anthro." Go ahead and steal this idea from me Anthro, if you are reading, I would be honored! I don't need reissues of prior products, but things that resemble the beautiful, tailored, high quality pieces of your golden years–the clothes that made you what you are today! You said it all exactly how I feel about the some of these trends Barbara! I really like that idea of a "Classic Anthro" line. Back when they re-released some of their classics, did those ever sell out fast! I mean really, it's such a no brainer lol. anthro employee here..chiming in and hoping i don't get in trouble. i have been following along on this blog since before i started working here, and it has always been interesting to read your perspectives. the comment section is my favorite thing! from a home office perspective, it is definitely entertaining to watch what all of us here in the community react to vs overall sales trends. i will say that, as an "old-anthro" enthusiast, i am so excited to see the changes that are happening here @ home office. it seems like we are still heading in the right direction…not necessarily through "old" anthro product…but a classic anthro mentality. the team transferred an exec merchant here from the uk team. she is incredible and beyond creative, it gives me hope lol. designers and merchants are bringing in vintage samples again for direction, employees are searching for new designers/brands, doing collaborations, digging into the archives. not necessarily to make identical product, but to back away from current trends, or re-invent them in the "anthro way". there seem to be conversations about the customer every day, instead of looking to trends in the younger/fast-fashion markets and imitating them. i still think this fashion cycle hasn't really swung our way in terms of classic/elegant pieces…but i feel like there has been a large shift for western consumers as a whole already that will swing it back our way again soon. many of my (previously addicted to zara) friends seem to be getting just as disillusioned from the fast-fashion cycle as we are, so that is promising. i hope anthropologie, and many other retailers, understand our need for items that stay personal and relevant for years. Thank you so much for sharing your perspective, @anthrolady! It gives me hope that the old attention to fit and detail is coming back. I've been buying far, far less at Anthropologie since I get more clothes and inspiration from the uk sties brownsfashion and matchesfashion. I still search Anthro for brands I can't find anywhere else in the US, but sizing info makes it a huge gamble with each order. Thank you for sharing this – it's encouraging! While Anthro needs to be aware of the latest fashions, I really like their clothes from 2008 – 2013. I read a review of the Sleeping on Snow Armana sweater on this blog (https://effortlesslywithroxy.com/2008/11/reviews-armana-jasmine-cardigan.html), bought it on eBay, wore it today and received compliments. It came out in 2008. I find a lot of items by reading old reviews on this blog and then buying the items on eBay. Too bad that Roxy can't get any referral fees for these purchases. YIKES that Lithe sweatercoat! That is amazing. Count me in as another customer who has gone from buying almost exclusively apparel to only homewares and accessories. Come to think of it, I have not purchased a single item of clothing from Anthropologie in the last year or more. Just the occasional belt or mug or cute kitchen implements. I have bought several Anthro clothing pieces in the last year — online from eBay. Even if they improve their designs, I don't know if they will get my custom back. They are getting really exclusive with sizing… meaning, they are purposely excluding a lot of customers. Practically every item that I bothered to take a second look at this year — like the Field Flower embellished cardigans — were not ever even available in an XXS or XXSP! These are clothing sizes that used to sell out full price or with a slight discount… Anthro is losing a lot of sales by snubbing customers in this size group. I'm 5'10" and normal weight for my height. I've been the same weight for decades but the size listed on the clothing I buy is shrinking. In my early 20s, I was considered "large", and now in my 50s and with vanity sizing, the Glencoe Plaid Sweater Coat fit me perfectly in size XS!!! That is insane. I'm hardly "extra small"!! So I can see where someone who is actually small/petite/thin is totally sized out. And the sizes XXS and XXSP were created somewhat recently because of vanity sizing. I mean, come on, "extra extra small petite"??? That sounds so ridiculous. And even the word "petite" has changed over time. In my 20s, "petite" meant someone who was tiny in weight/shape/height. But now you can be obese and be considered "petite" which makes no sense to me. I'm surprised at the increased sales. I'm a huge Anthro fan and still find some loves but I have hardly purchased any clothing there this year. Unlike other I have not bought many housewares there either. I used to love their dishes and bedding, but it is too floral and out of line with my decor lately. I have better luck at Target frankly. I hope they turn it around, as there are still some lovely pieces, but over all it is a big disappointment. I have a birthday and the holidays in December, but this year didn't ask for anything from Anthro. Too expensive and not much that is flattering and a little bit special. Thank you Roxy for your blog which I very much enjoy reading. Now Anthro if your are reading these comments/blogs — STOP with the utterly ridiculous clothing!!!!!! No one wants short boxy tops/sweaters (I am not a teenager! ), I hate all the large puffy sleeves, fringe, pom poms etc. It seems that the clothing is trying to be trendy where as it is actually very ugly. I have found a few pieces that I have bought on SALE but would not have purchased otherwise. My money has been going to 2 sites in the UK whom offer classic pieces with a little twist. You've piqued my curiosity: which sites? This is ot but dies anyone know if free people will have a full price promo before Christmas? They already did their yearly 25% promo – it was the week before Thanksgiving. They've been having a lot of promos on select items, though, and some of them have been really good – 50% off! Are you signed up for their emails? Yes I am that’s how I discovered I must have the embroidered mia dress 🤪. But if there’s going to be a promo I’d rather not spend $128!! I’ll just keep my eye out. I’m obsessed with the dress. It’s gorgeous! -There is a fine line between trendy and tacky. A lot of the current selection is tacky. NO MORE POM POMS OR FUR ON ARM PITS PLEASE. -More people would buy tops if they were longer. I have a job. Work attire means no belly shirts. It's really very simple. -I miss pretty dresses and tops. We like embroidery, and beads, and lace. We don't like cheaply made products. We want it to look special. When I wear something Anthro, I can count on people asking me where I got it from. Because it looks one-of-a-kind. This hasn't happened in a long time because everything is too run of the mill. If it's amazing, it sells out. It should be very simple to see what's working if they look at the sold out products. -I think the jewelry and accessories selection is limited. I prefer a statement piece to a gold chain and I rarely see that anymore. Think Pam Hiran. I rarely find a scarf I need either. I used to buy sooooo many scarves. -Home decor is A+. Love the mugs, the platters, the pillows, etc. Keep it up. -Totally agree about social media. It's no longer fun to look at instagram. It's too manufactured now. Everyone is sponsored and wearing high cost clothing and posing in fake settings with photographers. It feels fake and turns me away from the product. I want to see real people wearing clothing in a day-to-day environment.